Eli Manning of the New York Giants waves to the crowd as he runs off the field after a game against the Washington Redskins on Dec. 31, 2017, at MetLife Stadium in East Rutherford, New Jersey. 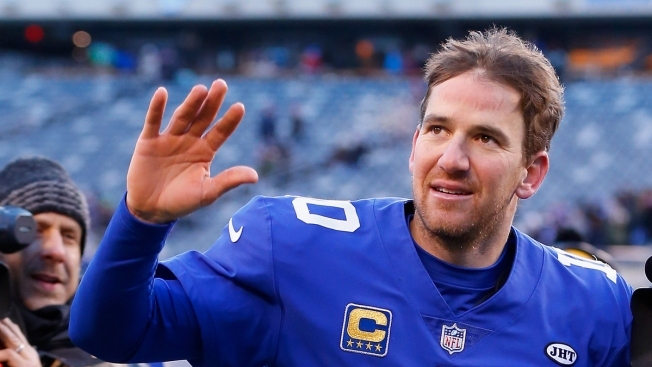 Three sports memorabilia collectors who accused New York Giants quarterback Eli Manning of providing bogus "game-worn" equipment that was sold to unsuspecting fans settled their lawsuit against the Super Bowl-winning quarterback on Monday, days before the case was scheduled to go to trial. Plaintiffs Eric Inselberg, Michael Jakab and Sean Godown had sought triple the amount of their alleged losses — which totaled less than $20,000 combined — for buying two helmets billed as worn by Manning. They also had sought punitive damages, and claimed in court filings they would produce evidence that would "show that Manning engaged in a pattern of knowingly providing items to Steiner Sports that he misrepresented as having been game-used when he knew they were not." Manning and the Giants had denied the allegations and characterized the suit as "inflammatory and baseless" in court filings. Inselberg filed the lawsuit in 2014. The suit claimed two helmets purchased by Inselberg and the two other plaintiffs — including one purportedly used by Manning during the Giants' 2007-2008 Super Bowl season — were bogus. Inselberg alleged photographic experts using a technique called "photomatching" could not find evidence that the helmets were ever used in games. The stakes were raised in the lawsuit in April 2017 when Inselberg's attorneys filed court documents that contained emails between Manning and equipment manager Joseph Skiba, who also was a defendant in the lawsuit. In one email, Manning asks Skiba to get "2 helmets that can pass as game used." When the emails went public last year, Manning angrily denied any wrongdoing. In a court filing this month, Manning's attorney wrote that the email was intended to ask Skiba for two game-used helmets that would "satisfy the requirement of being game-used." "Manning never instructed Joe Skiba to create any fraudulent memorabilia," attorney Robert Lawrence wrote. "Rather, Manning believed that if he asked Joe Skiba for his helmets, he received his game-used helmets and that the helmets he received from Skiba were his game-used helmets." In the same court filing, Manning's lawyer accused Inselberg of being "engaged in a decades-long memorabilia scheme" in which he obtained, without permission, game-used Giants equipment, including Manning's, from Skiba and Skiba's brother, Ed, as well as a local dry cleaner.